Rudy Boivin began volunteering with the Manitoba Golf Association in 1980. He is a founding member of the MGA Golf Annual Magazine (later the Golf Manitoba Journal) and from 1980 to 1982 was Chair of the Advertising Committee for that magazine. In 1982, he became a starter and scorer at MGA events and remains committed to that volunteer role today with Golf Manitoba. In 1983 he joined the MGA Board of Directors and was the Chair of the Tournament Committee in 1986/87 and the President in 1988. He also served as the Non-Playing Captain for the Willingdon Cup Team in 1985, 1986 & 1987. From 1989 to 1994 he was nominated by the Manitoba Golf Association for the Board of Directors of the Manitoba Sport Federation, elected for 3 terms and Chair of Marketing Committee for four years. He is a current member of the Marketing & Communications Committee of Golf Manitoba. He served on the Manitoba Golf Scholarship Fund Board of Directors from 1990 to 2010 and was President of that organization from 1999 to 2005. He was also a member of the Manitoba Golf Hall of Fame Board of Directors from 2002 to 2007. Rudy Boivin has been a member at the Southwood G&CC since 1966. He served on the Board of Directors from 1971 to 1978, was Member of the Year in 1976, President in 1977, Club Captain from 1990 to 1993 and honored in 2003 as a Life Member. His devotion to amateur golf is extremely evident as he continues to be involved in committees and tournament activity after 31 years of dedicated service. 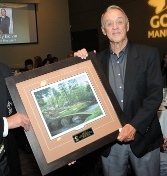 At the Golf Manitoba Annual Awards Dinner in October of 2011, Rudy was presented with our Distinguished Service Award for his years of dedicated service. “Rudy Boivin has shown true passion for both the Manitoba Golf Association and Golf Manitoba” said Rob MacDonald, President of Golf Manitoba. “His long term commitment is a true asset to our Association and we are pleased to recognize him with the Distinguished Service Award”.